This Anchor with Turquoise Chevron Print Is Set In A Bronze Bezel Setting and Has A Glass Cab Overly. 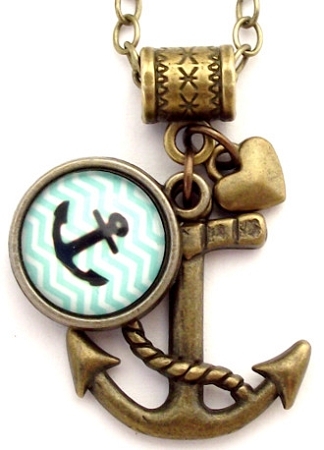 It is Layered with a Antiqued Bronze Anchor and Heart Charm. It Hangs 1" from a 20" Adjustable Antiqued Brass Chain.